Certified Organic Apple Cider Vinegar. It is unfiltered, unheated, unpasteurized, and 5% acidic. Contains the amazing Mother of Vinegar which occurs naturally as strand like enzymes of connected protein molecules. Organic Raw Apple Cider Vinegar is made from delicious healthy, organically grown apples. Processed and bottled in accordance with USDA guidlines. It is certified organic by organic certifiers. It is an wholesome way to add delicious flavors to salads, veggies, most foods and even sprinkle over popcorn. Many of the home remedies for common ailments listed below, call for a tonic of apple cider vinegar (ACV) made by mixing 2 or 3 tea spoons of Apple Cider Vinegar in an 8 ounce glass of water and drinking this before or during each meal. By taking this nutritious tonic you will, at the very least, be helping to reduce the nitrient deficiencies that result from a typical western diet containing many processed, refined foods. Natural healing Apple Cider Vinegar kills germs and nourishes the body at the same time, so have a look at some of the many different ways people have been benefiting from the external and internal application of this folk medicine. Note - If you take Apple Cider Vinegar between meals or before going to bed, always rinse your mouth to avoid any prolonged vinegar contact with the enamel on your teeth. Any acid food or drink however, such as citrus fruit, soda pop amd apple cider vinegar can erode tooth enamel if it is allowed to stay in contact with the teeth for long period of time. Apply a solution of apple cider vinagar and water (2 tablespoons to 1 eight ounce of glass of water) with a cotton ball several times a day. This will help reduce infection and dry our inflammation. Message the sore joines with a liniment made up of 2 egg whites, 1/2 cup apple cider vinegar, and 1/4 cup olive oil. Also, simply taking the apple cider vinegar tonic (2 or 3 teaspoons to 8 ounces of water) before eack meal has been an effective natural healing home remedy for many people. Some people have found relief from mild asthma by taking the apple cider vinegar tonic along with applying a vinegar-soaked compress to the inside of the wrists. Take 1 tablespoon of apple cider vinegar and 1 tablespoon of honey in a glass of water twice a day to help lower blood pressure. The high potassium values in both natural healing substances hels to balance out sodium levels in the body, which aids in maintaining blood pressure within healthy limits. Apple Cider Vinegar and honey also contains magnesium, a mineral that works to relax blood vessel walls and thus lower high blood pressure. To maximize the benefits of this and other home remedies, take a holistic approach and couple this with dietary modifications such as reduced fat and salt intake, increased fiber intake, moderate coffee and alcohol, no smoking and daily exercise. Due to its mineral content, Apple Cider Vinegar helps to sustain bone mass and fight against osteoporosis. The important minerals involved include manganese, magnesium, phosphorous, calcium and silicon. Take the Apple Cider Vinegar tonic to boost the body’s supply of these minerals. Apples and Apple Cider Vinegar, contain numerous substances that protect against many types of cancer. They contain beta-carotene, a powerful antoixidant, and phytochemicals such as flavonoids and polyphenols that are also protective against cancer formation. Also they both contain pectin, a soluble fiber, which binds certain cancer causing compounds in the colon and speeds up their elimination from the body. So eat an apple a day and take the general apple cider vinegar tonion – home remedy to maximize these benefits. It is found that the water soluble fiber pectin, found in apple cider vinegar, absorbs fats and cholestrol and eliminates them from the body. And at the same time, the amino acids present in the apple cider vinegar neutralize some of the harmful oxidized LDL cholestrol. Recently, researchers from Mizkan, a japanese food manufacturer, reported that regular vinegar intake of 3 teaspoons or more per day can significantly lower the level of cholestrol in a persons blood. At the first sign of cold, take 1 teaspoon of apple cider vinegar in half a cup of water several times a day. The body becomes more alkaline during a cold and the vinegar will help to rebalance the body’s acid level. If you hvae a chest cold, long standing home remedy calls for soaking a piece of brown paper in apple cider vinegar and then sprinkling one side of it with black pepper. Place the peppered side of the paper on the chest, cover with a towel and relax for 20 minutes. A low fiber diet and the reduction in digestive adics and enzymes as we age, can lead to constipation. More fruits and vegetables and a daily tonic of apple cider vinegar is a natural healing home remedy to combat constipation. Soak your feet for half an hour in a warm bath containing half a cup of apple cider vinegar. Use a clean pumice stone to rub the affected areas then apply pure apple cider vineagr and cover it with bandage. A home remedy to smooth a night time cough is to sprinkle apple cider vinegar on a cloth placed on a pillow. A daily tonic of apple cider vinegar (2 or 3 tea spoons to 8 ounces of water) supplies dietary fiber and other ingredients, which are beneficial in controlling blood glucose levels. As well, the acids and enzymes promote better digestion and nutrient absorption, which is impaired in many diabetes sufferers. Use a 50/50 mixture of apple cider vinegar and water to eliminate the bacteria and fungus that case diaper rash. Pectin, the water soluble fiber in apple cider vinegar, will help to absorb water in the intestines and provide more bulk for the stool. Also, intestinial bacteria transforms pectin into a protective coating which sooths the irritated lining. The well known over the diarrhea preparatioin, kaopectate contains pectin. So take the natural healig apple cider vinegar tonic (2 or 3 teaspoons to 8 ounces of water) to help eliminate diarrhea. Aw we age, it is common for people to produce less stomach acid (hydrochloric acid) which can lead to digestive problem. Taking the apple cider vinegar tonic home remedy (2 or 3 teaspoon to 8 ounces of water) before a meal will enhance the action of your stomach’s acid and digestive enzymes. Research has shown that people have slighlty more alkaline urine when they have a headache. An Apple Cider Vinegar tonic will help restore your body’s acid/alkaline balance. According to one home remedy, inhaling vapours from a small bottle of apple cider vinegar can also help or if you hvae a vaporizer, add about 2 tablespoons apple cider vinegar to the water and inhale the vapors for five minutes. Heartburn or acid reflux is a condition in which some of the acid content of the stomach periodically backs up into the esophagus. Even though testimonials abound a lot on the effectiveness of using apple cider vinegar to relieve hearburn, no scientific studies have been done to substantiate this. One of many natural healing home remedies for a sore throat involves gargling with a mixture of 1 teaspoon of apple cider vinegar to half a cup of water, using 3 mouthfuls of mxture each hour. 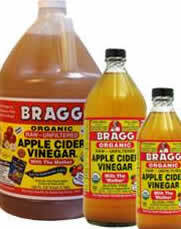 As P. Bragg warns in her book “Apple Cider Vinegar-Miracle Health System”, don’t swallow the gargled mixture, because Apple Cider Vinegar acts like a sponge drawing out throat and mouth germs and toxins. The use of apple cider vinegar as a home remedy for weight loss is centuries old. Dr Javis maintained that an overweight person could loose weight gradually by taking 2 teaspoons of Apple Cider Vinegar in a glass of water at each meal. No change in the daily food intake is required except to avoid high fat containing foods. This is by no means a complete list of natural healing home remedies that use apple cider vinegar. 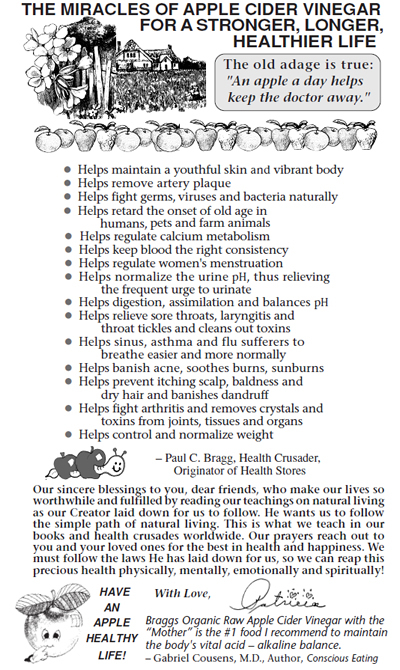 Many more can be found in excellent book title – Dr. Earl Mindell’s Amazing Apple Cider Vinegar.